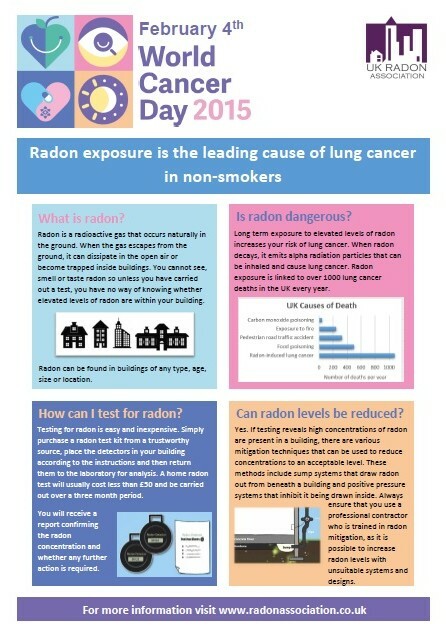 Wednesday 4th February 2015 is World Cancer Day, giving us a fantastic opportunity to raise awareness of radon gas, the second leading cause of lung cancer in the UK. Our goal is to increase awareness of radon so that people can make a decision whether or not to test their home (we recommend that all homes are tested). Radon testing is the only way to know whether a building contains elevated levels of radon and whether the occupants are at risk of developing lung cancer. We have created a simple factsheet and we hope that this will be shared with friends, family and colleagues to spread the message that radon is the second leading cause of lung cancer. Print it and pin to your staff noticeboard, tweet it with the hashtags #worldcancerday & #radon or email a link to your nearest & dearest.